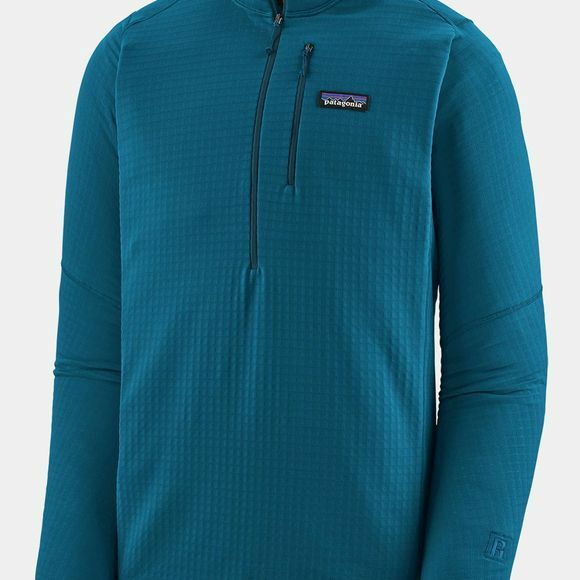 The Mens R1 Pullover from Patagonia is designed with a high/low interior grid polyester/spandex fabric (Polartec Power Grid) that stretches, breathes, moves moisture and insulates–made exclusively for Patagonia to be both light and breathable. Its technical fit accommodates light underlayers or works as a stand-alone top, and it squashes down to practically nothing in your pack. Polygiene permanent odor control. Simple cuffs stay comfortable against the wrists (the cuffs and hem are finished with ultrasoft binding material), minimalist zippers reduce bulk and a soft, kissing-welt zipper garage at the chin offers next-to-skin comfort. With a smooth, microfiber face for easy layering, redesigned offset shoulder seams for pack-wearing comfort and a zippered left-chest pocket.